(Sissingh (1977 و زون‌های NP1-NP6 از زون بندی (Martini (1971 همخوانی دارد. Calcareous Nannofossils of the Gurpi Formation have been investigated at Kalchenar section (Northwest of Izeh). In this section, the Gurpi Formation is mainly consists of marls, shaly marls and marly limestones. For introducing index species, calcareous nannofossil assemblages and biozones, 150 slides have been studied which led to the recognition of twelve biozones. As a result, 61 species, 35 genera of calcareous nannofossils were detected. According to the identified biozones, the age of the Gurpi Formation is Late Campanian to Late Paleocene (Late Selandian) and K/Pg boundary is continuous at the studied interval, that is corresponding to CC21- CC26of zonation scheme of Sissingh (1977) and NP1- NP6 of zonation of Martini (1971). درویش‌زاده، ع.، 1370- زمین­شناسی ایران. انتشارات نشر دانش امروز ، 901 ص.
Alavi, M., 2004- Regional stratigraphy of the zagros fold thrust belt of iran and its proforland evolution. Ameracan Journal of Science, 304:1-20. Bordenave, M. L., 2002- The Middle Cretaceous to Early Miocene Petroleum System in the Zagros Domain of Iran, and its prospect Evaluatio, AAPG Annual Meeting, March 10-13, 2002, Houston, Texas. Bornemann, A., Aschwer, U. and Mutterlose, J., 2003- The impact of calcareous nannofossils on the pelagic carbonate accumulation across the Jurassic-Cretaceous boundary. Palaeogeography, Palaeoclimatology, Palaeoecology, 199:187-228. Bown, P. R. and Young, J. R., 1998- Techniques; In: Bown, P.R., (Eds. ), Calcareous Nannofossil Biostratigraphy. Chapman and Hall, London, 16- 28. Bralower, T. J., 2002- Evidence of surface water oligotrophy during the Paleocene-Eocene thermal maximum: Nannofossil assemblage data from Ocean Drilling Program Site 690, Maud Rise, Weddell Sea. Paleoceanography, 17: 1-12. Bralower, T. J., 2005- Data report: Paleocene–Early Oligocene calcareous nannofossil biostratigraphy, ODP Leg 198 Sites 1209, 1210, and 1211 (Shatsky Rise, Pasific Ocean). In: Bralower, T.J., I. Premoli Silva and M.J. Malone, (Eds. ), Proceedings of the Ocean Drilling Program, Scientific Results, 198, 1–15. Brand, L. E., 1994- Physiological ecology of marin coccolithophores. In: Winter, A., Siesser, W.G., (Eds. ), Coccolithophores. Cambridge University Press, 39-49. Burnett, J. A., 1998- Upper cretaceous. In: Bown P.R., (Ed. ), Calcareous nannofossil Biostratigraphy. Chapman and Hall, London, 132-199. Erba, E., 2004- Calcareous nannofossils and Mesozoic oceanic anoxic events: Marine Micropaleontology 52: 85-106. Hadavi, F. and Ezadi, M., 2007- Biostratigraphy of the Gurpi Formation in Dare- Shahr section (Zagros basin). The First MAPG International Convention Conference and Exhibition, 28-31. Herrle, J. O., 2003- Reconstructing nutricline dynamics of mid-Cretaceous oceans evidence from calcareous nannofossils from the Niveau Paquier black shale (SE France): Marine Micropaleontology, 47: 307-321. Huber, B. T. and Watkins, D. K., 1992- Biostratigraphy of Campanian- Maastrichtian calcareous plankton in the region of Southern Ocean: paleogeographic and paleoclimatic simplications. In: Ken-nett, J.p., Warnke, D.A. (Eds. ), The Antarctic paleoenvironment a perspective on global change. AGU, Antarctic Research Series, 56, 31-60. Jalali, M. R, 1971- Stratigraphy of zagros basin. National Iranian Oil Company, Exploration and Production Division Report no.1249 and 1072, 34-36. James, G. A. and Wynd, J. C., 1965- Stratigraphy nomenclature of Iranian Oil consortium Agreement Area: American association petrolum geologist bulletin. 49: 49. Lees, J. A., 2002- Calcareous nannofossil biogeography illustrates palaeoclimate change in the Late Cretaceous Indian Ocean:Cretaceous Research, 23: 537-634. Martini, E., 1971- Standard Tertiary and Quaternary Calcareous Nannoplankton Zonation. In: Farniacci, A. (Ed. ), Proceedings, 2th International Conference on Planktonic Microfossils. Rome, Italy. EdizioniTecnoscienza, 2, 739-785. Motiei, H., 1995- Petroleum Geology of Zagros. 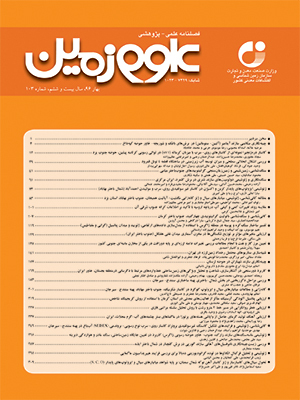 Geological Survey of Iran (in Farsi), 589. Okada, H. and Bukry, D., 1980- Supplementary modification and introduction of code numbers to the low-latitude coccolith biostratigraphic zonation. Marine Micropaleontology, 5: 321–325. Perch-Nielsen K., 1985a- Mesozoic Calcareous Nannofossils. In: Bolli H.M., Saunders J.B., Perch-Nielsen, K. (Eds. ), Plankton Stratigraphy. Cambridge University, 329- 426. Perch-Nielsen, K., 1985b- Cenozoic Calcareous Nannofossils, In: Bolli, H. M., Saunders, J. B., Perch-Nielsen, K. (Eds. ), Plankton Stratigraphy. Cambridge University Press, 427–554. Senemari, S. and Sohrabi Molla Usefi, M., 2012- Evaluation of Cretaceous–Paleogene boundary based on calcareous nannofossils in section of Pol Dokhtar, Lorestan, southwestern Iran.Arabian Journal of Geosciences, 6: 3615-3621. Shamrock, J. L., and Watkins, D. K., 2009- Evolution of the Cretaceous calcareous nannofossil genus Eiffellithus and its biostratigraphic significance: Cretaceous Research Journal. 30:1083–1102. Sissingh, W., 1977- Biostratigraphy of cretaceous calcareous nannoplankton:Geologie En Minjbouw, 56: 37-65. Thierstein, H. R, 1976- Mesozoic calcareous nannoplankton biostratigraphy of marine sediments. Marine Micropaleontology, 1: 325-362. Villa, G., Fioroni, C., Pea, L., Bohaty, S. and Persico, D., 2008- Middle Eocene-late Oligocene climate variability: Calcareous nannofossil response at Kerguelen Plateau, Site 748. Marine Micropaleontology, 69: 173-192. Watkins, D. K., 1996- Upper cretaceous calcareous nannofossil biostratigraphy and paleoecology of the southern ocean. In: Moguilevky A., Whatley, R. (Eds. ), Microfossils and Oceanic Enviroments. University of Wales, Aberystwyth-press, 355-381. Williams, J. R. and Bralower, T. J., 1995- Nannofossil assemblages, fine fraction stable isotopes and the paleoceanography of the Valanginian-Barremian (Early Cretaceous) North Sea Basin: Paleoceanography, 10: 815-864. Wise, S. W., 1988- Mesozoic-Cenozoic history of calcareous nannofossils in the region of Southern Ocean: Palaeogeography, Palaeoclimatology, Palaeoecology, 67: 157-179. Young, J. R. and Bown, P.R., 1998- Cenozoic calcareous nannoplankton classification. Journal of nannoplankton Research, 19:36–47. Zahiri, A. H., 1982- Maastrichtian microplankton of well Abteymur-1 S.W. Iran: NIOC, Expl. Div. Tech. Note No. 226, Unpublished.